Kit performed exactly as advertised. Videos on website were extremely helpful. After repair, XR16's sound like new. Ordered 12" kit at same time expecting to need to repair those drivers in future. Worked great. Thought the speakers were trash. The video was very helpful. Great product for the money with great support and service. Directions were spot on to make my 35 yea old speakers sound like new! I bought these foam surrounds because it seemed like a good "kit". When I went to install them, I had a question, called, and the phone was picked up immediately, and my concerns were put to rest. I installed the new foams with no issue, though I did elect to open the dust cap and shim the speaker. I tried the 50 HZ signal method as seen on YouTube, and just centering them by feel as recommended here, but wasn't confident, so did it the "hard" way, spent a few more minutes and had perfect results! I am really happy with this purchase. After refoaming my McIntosh 8" subwoofer it works fine. The sound is almost the same as it was before the damage of original foam. Thanks a lot for this product! Q: What is the size of the roll for this particular kit? A: The roll width is 9/16". All dimensions including roll width are shown on the size chart on the product page. Thanks. Q: Hi, can you advise how I remove the sub woofer from the rear parcel tray. (2003 Subaru Legacy)? A: Please visit the website: www.carstereoremoval.com. They have online instructions for removal on most vehicles. Q: Are the surrounds made of polyether and do they have a 3/4 inch roll? A: Yes, and the roll width is 9/16". All dimensions including roll width are shown on the size chart on the product page. Thanks. 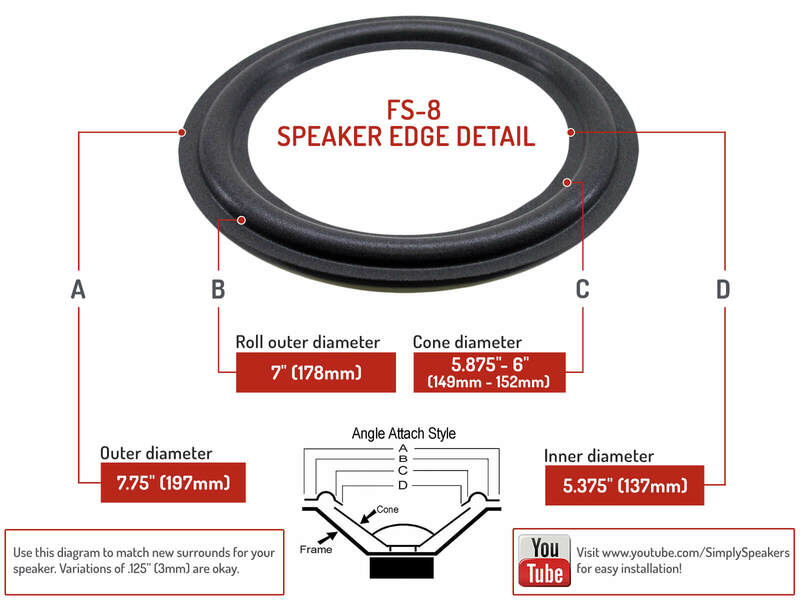 Q: Will this kit work for 8" mid-range driver for McIntosh XRT-22 speaker system? 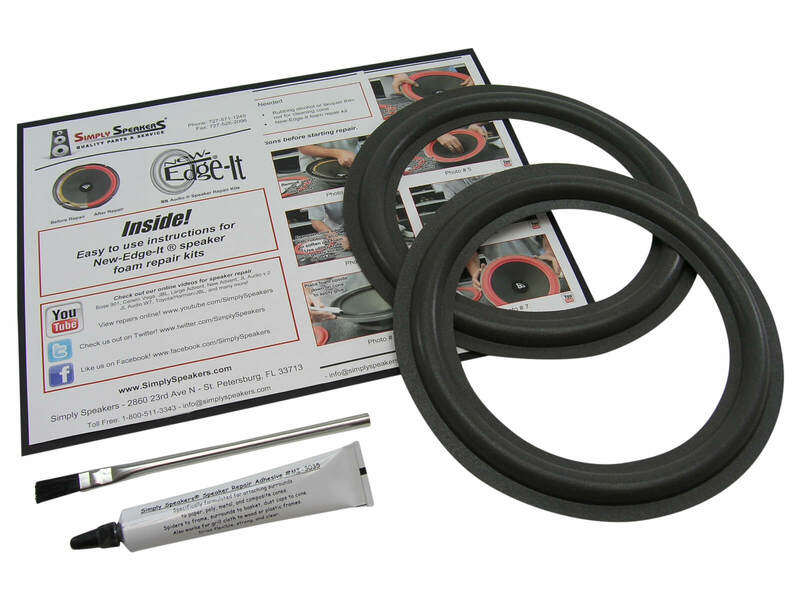 Does this kit include a gasket (if original does not come off in one pc.? A: Yes, this is the correct kit for your XRT-22 midrange. The rear gasket will stay intact upon removal. The front gasket is part # GAS-8 if needed. Q: For ML-1C 8" midrange specs show it should be 1/2 roll, specs on yours show 9/16? A: 1/2 (8/16) and 9/16 roll widths are compatible. McIntosh: 36025, MC-1, MC1, ML-C2, MLC2, ML-1C, MC1C, ML-2C, ML2C, ML-2M, ML2M, ML-4, ML4, XL-10, XL10, XR-16, XR16, XR-5, XR5, XR-6, XR6, XR-7, XR7, XR-19, XR19, XRT-20, XRT20, XRT-22, XRT22, M-406, and many more!